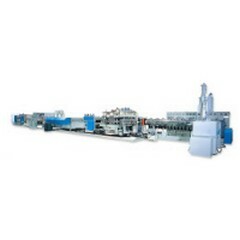 Product Name: PP/PC Hollow Profile Sheet Extrusion Line. Occupied ground area 33300mm×5600mm×2800mm (L×W×H) PS. We manufacture machinery to meet customers requirement.